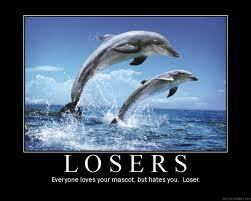 The Miami Dolphins are obviously jealous of the New York Jets. Up until this point in the offseason, the Jets have been by far and away the dumbest organization based on their personnel moves. Bringing in Tim Tebow to run a second offense and be the up-back on the punting team… brilliant guys! I guess word got out that the Jets were taking over all the bonehead moves and were flirting with HBO once again, which would have served as a great way to introduce their circus to the world. Today it was announced that the Dolphins couldn’t stand to give their rivals all the attention, and announced that they will be the team that stars in Hard Knocks this season. The Dolphins will start this season with a rookie head coach, ex Green Bay offensive coordinator Joe Philbin, and potentially a rookie starting QB as well, as Miami spent their first round pick drafting Ryan Tannehill out of Texas A&M. This is great planning Miami! Take a kid who has never been in the league before, a new head coach who has never run an organization before, and throw cameras in their faces during their first ever mini-camps. Also, lets show the entire world how they handle their business, before they really know how to handle their business! Way to set up your team for great success. When asked about the organizations decision to appear on the show, Philbin said “The Miami Dolphins have long been synonymous with success on the field as evidenced by our five Super Bowl appearances and the only perfect season in NFL history.” Joe, we understand that Don Shula was a good coach. Hell, that Dan Marino was a pretty good QB as well. But let’s look at the recent history. Miami has finished below .500 in 7 out of the past 8 years. Since Dan retired in 1999, the Dolphins have won 1 playoff game, and that was in the 2000 season! They have only been to the playoffs two other times since then, and were eliminated in the first round in both years. Terrific legacy Joe, your fans must be really proud. 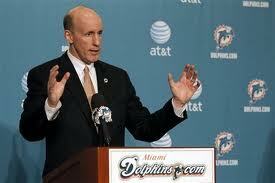 The Dolphins are not marketable. Their biggest draw is Reggie Bush, who is better known for his college ball and flings with reality TV stars. The Dolphins thought they were the front-runner in the Peyton Manning sweepstakes, as Manning already has a permanent residence in Miami. After Manning visited with the Dolphins, he quickly signed with the Broncos. I guess he had more respect for what Elway was selling him then Marino, who reached out to Manning and urged him to give Miami a whirl. Their other notable offseason moves were trading away Brandon Marshall to the Bears, and the retirement of Jason Taylor. There is nothing interesting about this team at all, making this decision by HBO extremely suspect. Tannehills, two things she has going for her! After careful consideration and research, I do believe I know what the driving force behind this decision might be. HBO has always been known for some great adult television and I believe they might be focusing on a new star. Ryan Tannehills wife Lauren is definitely an individual that the execs at HBO will want to give as much television time as possible. They might even want to consider doing a late night episode of Hard Knocks, maybe call it REALLY Hard Knocks. Also, now that Kris Humphries is out of the picture, maybe HBO can give Kim Kardashian a call and see if she and Reggie could work out their issues. Lauren Tannehill and Kim Kardashian would probably get some fairly decent ratings in the 18-65 male demographic. If they choose to go a more traditional route and actually talk about football, I would say the only thing more boring than that would be an actual Dolphins game! This entry was posted on May 29, 2012 by NY Bobby. It was filed under Football, Miami Dolphins .